You’d think organic chemistry is hard enough already. It’s all methyl-this and hydroxyl-that; here an H2, there an O2, everywhere a hydrocarbon — just figuring out a chemical formula is exhausting. Then there’s sorting out the structure and atomic bonds, which is a whole other ball of difficult. Surely, that should be enough to characterize a molecule, right? Wrong. It turns out you can have two organic compounds with the same formula and the same structure — but they’re mirror images of each other. Like how your left hand looks like your right hand, but they’re not quite the same thing. 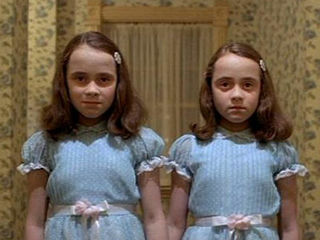 Or how those creepy twins from The Shining look alike, but you just know one is a little bit eviler than the other. In chemistry, these mirror images are called enantiomers. Most of them come about because carbon is, shall we say, somewhat “promiscuous”. A carbon atom can stably bond to four other atoms at once — which, seriously, who has the energy for that? I have trouble enough keeping just one atom happy at home. Meanwhile, the chained-up carbon often has a kink put in the angles of its other possible bonds. So if, say, a hydrogen and an oxygen atom jump in, one of these might end up bonding on a side more “left”, while the other winds up on a side facing more “right”. But the next time around, things could get flipped — the hydrogen could wind up where the oxygen was, and the oxygen where the hydrogen ought to be. If we were making candy, this might be a Reese’s peanut butter cup. But we’re making organic molecules instead, so the two ever-so-slightly different molecules are called enantiomers. Less delicious, perhaps — but pretty important. That’s because many enantiomers aren’t like creepy horror movie twins, who behave in exactly the same creepy, twinny way. They’re more like celebrity twins — say, Mary-Kate and Ashley Olsen, for instance. So maybe one enantiomer goes through a little goth phase, while the other does a stint on Weeds and then dabbles with plastic surgery. Or, you know, maybe they just have different chemical properties. It’s not a perfect analogy. Enantiomers are a big deal in pharmacology, because many clinical drugs are made from organic compounds and synthesizing these sometimes also means dragging a mirror-image molecule along for the ride. A soup of two enantiomers in equal amounts — called a racemic mixture — isn’t always a problem. Sometimes, the “twin” behaves similarly enough to be of some benefit. Other times, the enantiomer is completely inactive — so while the dose of such a drug might be twice as high (to make sure enough of the “good twin” is present), it’s otherwise okay. In this case, scientists might leave the compound as-is or decide to purify it further; the compound in Lunesta is an example of a drug made from one enantiomer separated from its mirror twin. In still other cases, the unintended enantiomer actually causes harmful side effects or competes with the compound in the body. For these drugs to work, they have to be made “enantiopure” — either separated from the mirror compound, or synthesized in such a way that only one form is possible. Imagine a world with a million Ashleys, and no Mary-Kates at all. BrightHub – Enantiopure medications: are chiral drugs more effective?